Scotland claimed their first Six Nations win of 2008 as they out-fought England in a grim battle at a wet and windy Murrayfield. Chris Paterson's kicks gave Scotland a deserved 9-3 lead at the break. England's solitary first-half points came from a Jonny Wilkinson penalty which saw him become the highest scorer in the history of Test rugby. Two more penalties put Scotland 15-3 up and a brace of Wilkinson penalties was not enough for the hapless visitors. The appalling conditions meant it was never likely to be a free-flowing affair and the main points of interest were the continued goal-kicking excellence of Paterson and Wilkinson. Paterson landed four successful kicks and has now not missed in an astonishing 30 attempts at Test level, while Wilkinson moved clear of former world record holder Neil Jenkins to set a new mark of 1099 points. Do you agree with our player ratings? The build-up to the match had been dominated by England coach Brian Ashton's decision to axe 20-year-old Danny Cipriani from the team for disciplinary reasons. And England's off-field problems followed them onto the pitch as they failed to establish any dominance up front, struggled to control what possession they secured and looked bereft of ideas when put under pressure. Scotland were limited in their approach but they put their bodies on the line and executed their game plan with far more conviction than England. Iain Balshaw, who had originally been dropped to make way for Cipriani, started the game at full-back for England and the Gloucester player was predictably tested from the off after his shaky display under the high ball against France. The first time Scotland fly-half Paterson received possession, he belted the ball into the heavens, but Balshaw proved equal to the task, taking a safe mark and clearing well. Scotland took the lead when the metronomic Paterson landed his 27th successful kick in a row after nine minutes. There was then a very nasty moment as Rory Lamont was knocked out when he collided with Balshaw's knees as the pair converged on a kick ahead. The Scotland winger was given oxygen as he was taken off on a stretcher and taken to hospital, but later reports said he was recovering well. Scotland brought on Dan Parks at fly-half with the versatile Paterson moving onto the right wing. The home side twice held firm after England tried to drive over through their forwards after kicking penalties into the corner. Despite being repelled on those occasions the England pack briefly looked like it was gaining the upper hand with their superiority at a scrum earning them a penalty after 27 minutes which Wilkinson slotted to set the new record. But Scotland came back into the game and two more penalties from Paterson gave the hosts a 9-3 lead at the break after 40 minutes of less than thrilling rugby. The game had been as shocking as the weather but the Scots were thoroughly enjoying themselves and they went 15-3 up with a penalty apiece from Paterson and Parks in the 10 minutes after the re-start. Neither side was creating much in attack but Scotland were managing to put England under lots of pressure with their defence as the visitors rapidly lost their discipline. Just as they looked like taking charge, Scotland's ill-discipline allowed Wilkinson, who had missed with a long-range effort in the first half, to land two penalties to cut the gap to six points. With over 10 minutes remaining Ashton decided to remove Wilkinson, whose kicking out of hand had been very poor, and captain Phil Vickery from the fray. 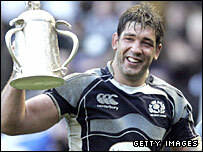 Their withdrawal was a major success for Scotland and they wound down the clock with some ease to repeat their 2006 success and reclaim the Calcutta Cup. Scotland: Southwell; Lamont, Webster, Morrison, Walker; Paterson, Blair; Jacobsen, Ford, Murray, Hines, MacLeod,Strokosch, Taylor, Hogg. Replacements: Parks for Lamont (21), Lawson for Blair (76), Dickinson for Jacobsen (64), Thomson for Ford (25), Smith for Murray (68), White for MacLeod (63), Brown for Hogg (72). England: Balshaw; Sackey, Noon, Flood, Vainikolo; Wilkinson, Wigglesworth; Sheridan, Mears, Vickery, Shaw, Borthwick, Croft, Easter, Lipman. Replacements: Tait for Flood (66), C. Hodgson for Wilkinson (70), Chuter for Mears (67), Stevens for Vickery (70), Kay for Shaw (66), Narraway for Lipman (73). Ref: J Kaplan (South Africa).